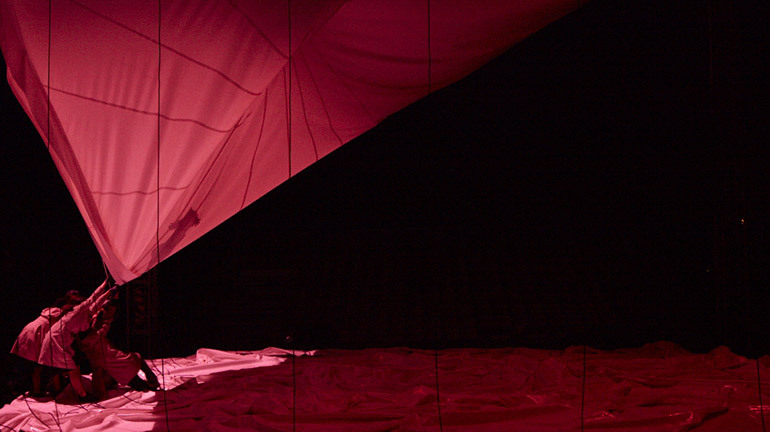 In Géométrie de caoutchouc -Rubber-Sheet Geometry- , the marquee is a cave, a mountain, a sea, a sky. We roam around these manifold spaces, thus exploring our relationship to the world, from the heavens to the underground. This rubbery space is unsteady ; the couples, women and men are subject to its alterations, its turmoils. These bodies and the marquee… what are they telling us ? Space designs us, space is stronger than us. We can run around the zeniths, wander through the stars, reach as far as space will allow us, yet we shall disappear. Space sustains us, and eventually space engulfs us. Humanity is confined within this timeframe. ’The law that supports space’-this should be the title appropriate to one of my future pictures. Each of your creations emerges from a reflection about space. What kind of scenic explorations is Géométrie de caoutchouc based upon ? The starting point is the marquee itself. I wanted to contemplate it literally, conducting a kind of study of this specific space. I thought the marquee belonged on centre stage, that is why I conceived the set with a marquee as scenery, an exact scale-model replica of the marquee accommodating the show. Yes. In my work everything can be regarded as a variation on space. This also applies to my dramaturgy. Now with Géométrie de caoutchouc, I continue the journey already followed by my previous creations : using what I call the « existent » as the inception. Here, the « existent » is the marquee. This space cannot be reduced to its connoted stereotypes, it harbours more valuable meanings and history than are usually infered. 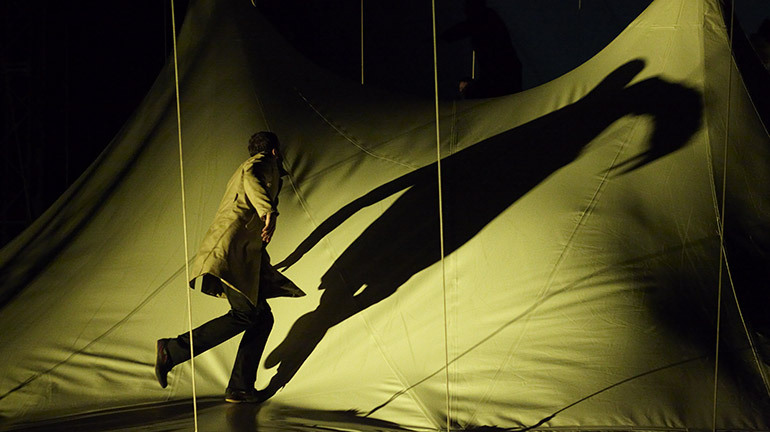 For example do you know that the word « scene » (stage in French) comes from the ancient greek « skene », meaning « tent » ? 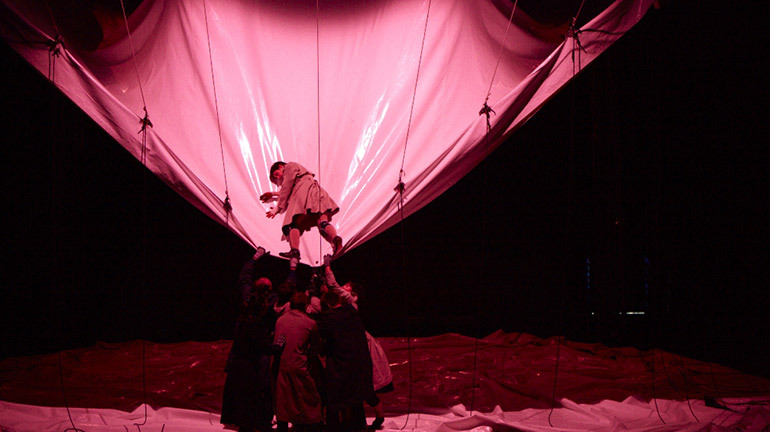 Theatre is deeply rooted in the pitching of a tent. A representation encased within its duplicate and thus exploring the modular concept of Russian dolls. The idea is to represent a container enclosed within another, a frame within the frame stressing the notion of emptiness. 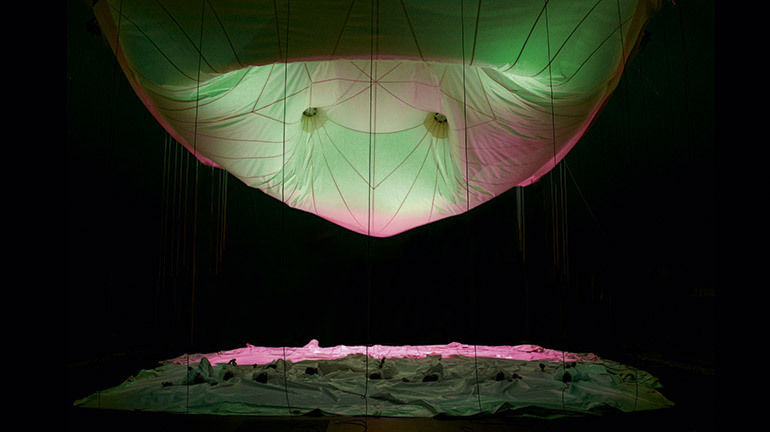 In the concept of space, the idea of emptiness is systematically a central theme. I have often thought that art may be a particular process creating this emptiness, a void, in order to allow the spectator to fill this void with their imagination. What is structuring the scenes in Géométrie de caoutchouc ? The continuous transformations undergone by the scale-model marquee, set into motion by the eight artists. They tackle this rubbery space, come to grips with its malleability. They follow its rises and falls, suggesting puppet theatre. I meant to work on the idea of wonder, whose essence is so elusive, however foreshadowed by the marquee. Indeed. 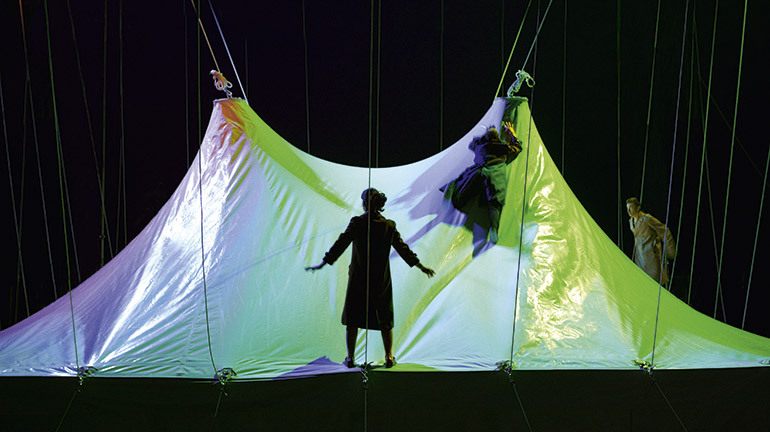 The limit between the scenography and the actors is porous. In each of my creations, there is always a point when objects can turn into actors and actors can become objects. Here, all eight artists come from the circus. Their performances are extremely athletic. Their bodies end up emerging as rubber-sheet geometries. There are rifts and creases on the human body, very much like on the canvas of the marquee. They are, in both cases, places of frailty. Somehow this show allows the audience to consider the marquee as a new medium, a space of modernity, a space of contemporary creation. I enjoy shifting and unsettling the audience’s expectations. Ideally, I would want Géométrie de caoutchouc to have as many interpretations as the number of spectators in the audience. I always try and leave as much space as possible for the audience. Ultimately, they apply the finishing touch to my work. Once again in this creation, we are confronted to the special attention you pay to imagination. To me, the experience of imaginary worlds is a fundamentally human experience. In my creations, my aim is to show imaginary worlds closely intertwined with the laws of physics surrounding us. The stage is one of the few fields of art where one cannot escape from the laws of classical mechanics. In order to stumble, all that one needs are feet… The occasion for such a mishap each man bears in himself. When your house already inhabits another house, which one will you dance in? When your big top already inhabits another big top, how will you make the square into a circle? Here, inside the geometry of a boxing match, the audience is already seated on all four sides. But each of them can only see one. At first, anyway. 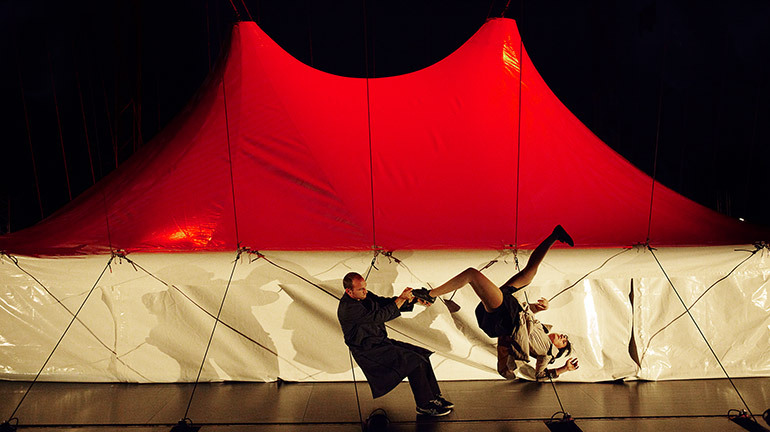 Aurélien Bory enjoys formal and architectural challenges, working either with materials which impose their rigidity (Plan B), or with props that slip away from the acrobat-dancers (Taoub). And as its name implies, Géométrie de caoutchouc portrays the shift from one to the other. 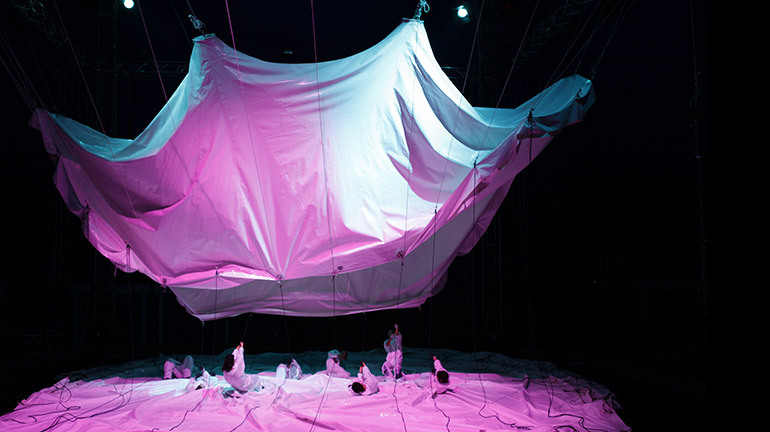 A group of eight humans are born beneath this white tent that occupies the stage. Each of them tries to scale it and master it. Slithers, struggles, collective efforts. And finally, disappearance. The rubber swallows up what it had given: life. 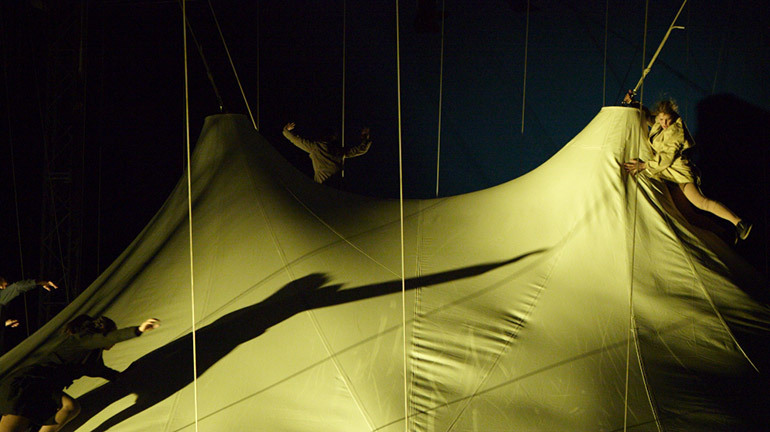 Having become a device, the big top sets the pace. 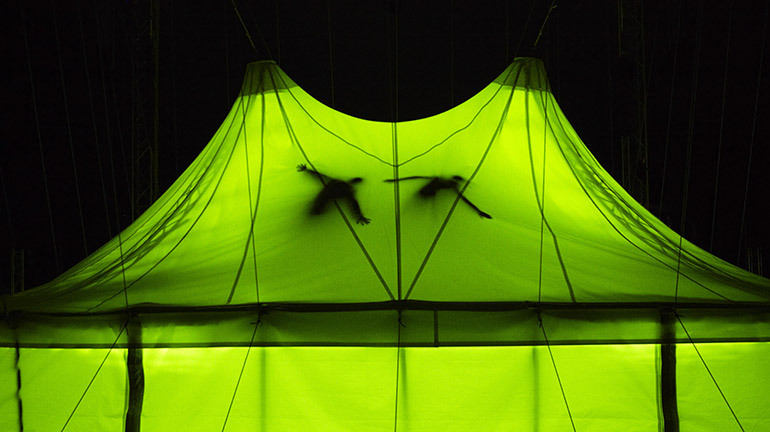 The roof flies away like a kite and the group pulls on the ropes to transform it into a work of art. 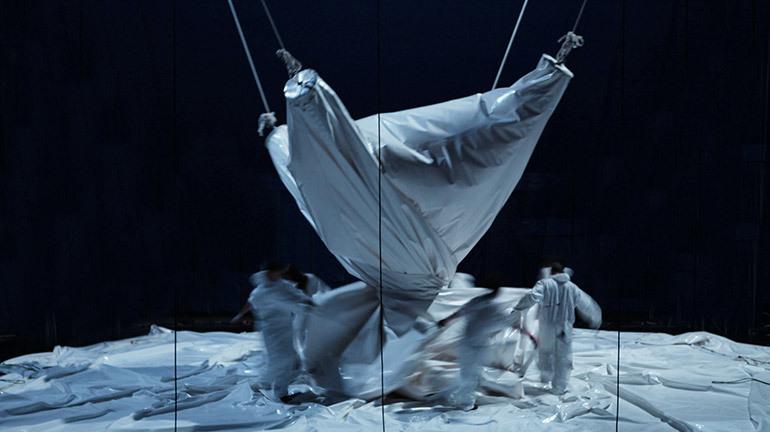 Imperceptibly, the choreography stems from this joint effort aimed at a celestial utopia of immaculate white. 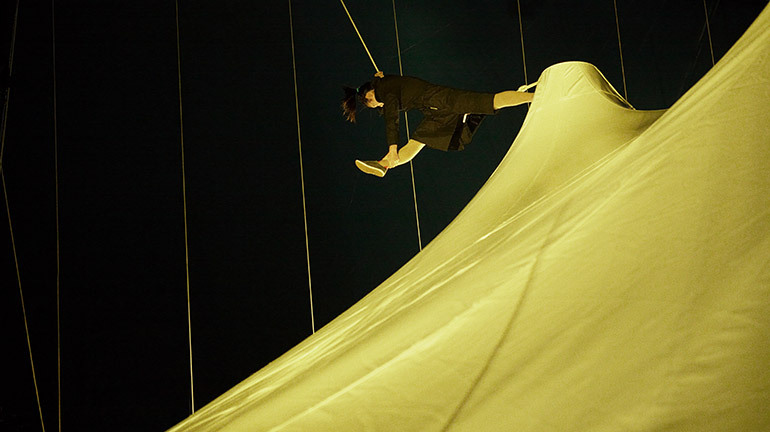 Between choreography, circus performance and plastic arts, Aurélien Bory imperturbably continues to make his way. I imagine a show where people come to see the place itself. 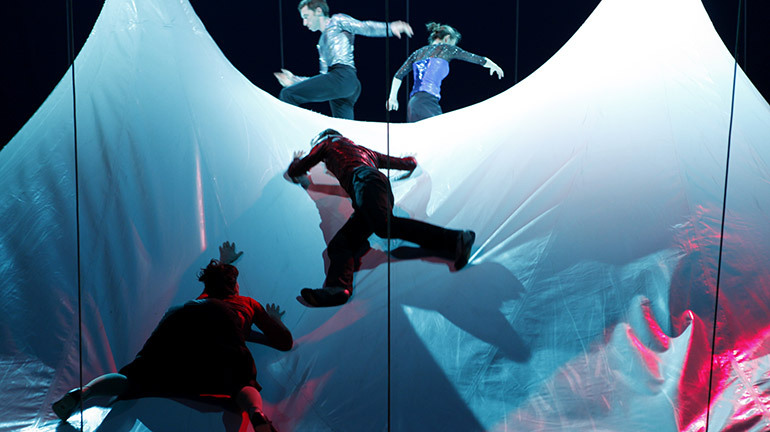 COPRODUCTION Le Grand T théâtre de Loire-Atlantique/Nantes, TNT – Théâtre national de Toulouse Midi-Pyrénées, Parc de La Villette/Paris, CIRCa Auch Gers Midi-Pyrénées, Cirque-Théâtre d’Elbeuf – Centre des arts du cirque de Haute-Normandie, Théâtre Firmin Gémier La Piscine – Pôle national des arts du cirque/Antony, Bonlieu – Scène nationale/Annecy, Le Volcan – Scène nationale/Le Havre, Le Parvis – Scène nationale de Tarbes-Pyrénées, Théâtre de Caen.